Like many vintage clothing collectors, I have a large collection of vintage photos. I am helplessly drawn to the ability to peer into the lives of average people of the past. In an effort to share and digitally catalog my collection, I have decided to start a new series on Livin' Vintage called Saving Style. Every so often I will share a photo or two from my collection, documenting the fabulous style that the average women of the past had. This photo above was pulled from an estate sale and I ended up with nearly a whole album from this woman. 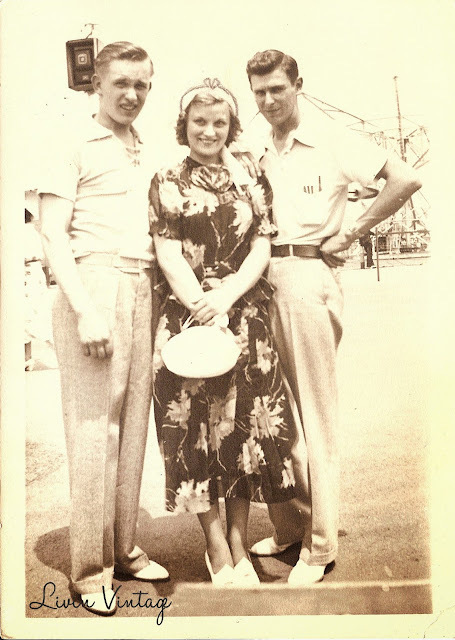 Here it looks like they are at a fair or maybe even a Coney Island type place. I just love the print on her dress and the man on the right's pocket full of pens!